Reimplemented in ClassGenericArgumentAttribute, ClassScriptableObjectAttribute, ClassComponentAttribute, ClassUnityObjectAttribute, and ClassExtendsAttribute. Reimplemented in ClassEnumFlagsConstraint, and ClassEnumFieldConstraint. 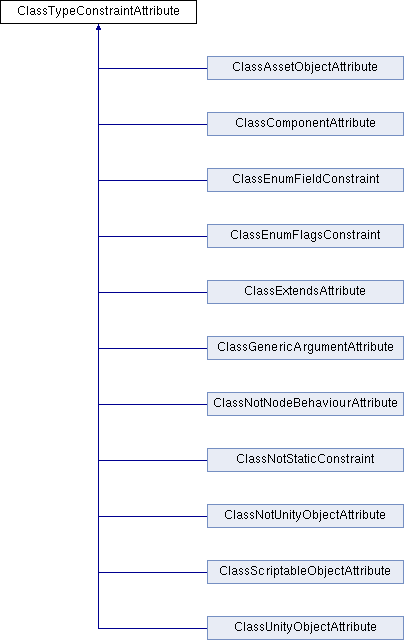 Implemented in ClassEnumFlagsConstraint, ClassEnumFieldConstraint, ClassGenericArgumentAttribute, ClassScriptableObjectAttribute, ClassComponentAttribute, ClassUnityObjectAttribute, and ClassExtendsAttribute.